With the divorce rate above 50 percent, more and more families are having to adjust to stepparenting. Being a new stepmom can be challenging. Expect a few bumps in the road and follow these tips to ease your transition into a blended family. Before you even think of marrying a man with children, you need to accept that you are marrying the whole family — that includes all the kids and any baggage that comes along with the situation. Divorce isn’t easy for anyone, particularly children. Therefore, you need to understand that your new stepkids are not going to accept you in a mothering role from the get-go. Don’t feel pressure to love your stepchildren right away, or for them to love you. Treat them with respect and care, and allow your relationship to develop naturally. Your stepkids might not be kind and respectful to you right away, but that doesn’t mean you should be immature and act the same way. You need to be a good role model. Treat each child with respect and care without forcing love and affection on them. Open the lines of communication by spending one-on-one time with each child and getting to know them. Try to find common interests and activities you can do together so they will begin to associate your relationship with positivity and start to accept you as a part of their blended family. As you transition into the family, don’t try to take over all the roles your husband previously played. He should continue to handle the discipline of his own children, particularly during the first year. If he always drives them to school or cooks up a special Sunday breakfast, let him continue to do so. Kids don’t need their whole lives to change drastically overnight. If your new stepkids are living with you part-time, provide them their own space in the home. They shouldn’t have to sleep on a pullout couch in your office when they come over for the weekend. That’s not the way to make them feel welcome. Take them shopping to buy some new furniture and other stuff for their space, and allow them to bring over some treasured items from their mom’s house. No matter how hard you try, you might not get a warm reception from your stepchildren right away. They are experiencing significant loss and changes in their lives that are out of their control. They didn’t ask for this to happen and are looking for someone to blame. It will take time for children to come to grips with the new reality and accept you as a permanent fixture in their lives. If your stepkids reject you or treat you unkindly, you have to be the mature one and not take it personally. With some effort and time, you will eventually develop respectful, loving relationships with one another. Want more? 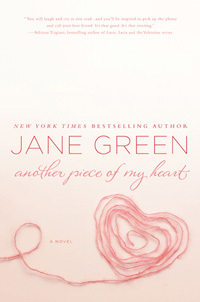 Check out a great read in the new SheKnows Book Lounge: Another Piece of my Heart by bestselling author Jane Green, a powerful novel that explores the complications of a woman marrying into a ready-made family, and the true meaning of motherhood. Head to our new SheKnows Book Lounge now.